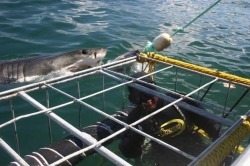 Lalo has been photographing and filming white sharks in South Africa for 5 years. His credits include working with National Geographic, Steve Erwin, Mike Row, Ryan Johnson and the legendary Andre Hartman. Many of Lalo's videos and photos are available for purchase to publications. Lalo can be found at Earnie's Pub when he's not on a boat. And yes, that's Lalo with his back turned to the shark.